I want to share with you a great website for purchasing ANYTHING teaching from: MPM School Supplies! The website is so user friendly and is extremely easy to navigate. There are different ways to search the items by different categories, to find just what you are looking for. I was able to search to look for popular items for Kindergarten, and then by specific subject. Within minutes I found exactly what I had in mind to purchase. My students really enjoy working with playdough during free time, and I realized that I don't own any playdough tools. I purchased three differet playdough toys for them to explore with. 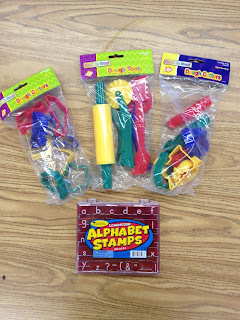 I also wanted a set of alphabet stamps to practice stamping out our sight words during center time. I put my order in, and my package arrived within four days! I was so excited to use these goodies with my kinders! Thanks so much for your lovely review! We're thrilled to hear that you had a positive shopping experience and couldn't be more excited that you were able to find some fun products to use in your classroom! While shopping can be fun, I realize this put one more thing on your plate and we really appreciate that you gave of your time to check out our teacher store and share your thoughts. Actual customer feedback is invaluable! Have a wonderful holiday season & happy learning!